An alternative is to try to catch and retrieve the target. That is the approach adopted by Malou Tech, a Parisian firm. 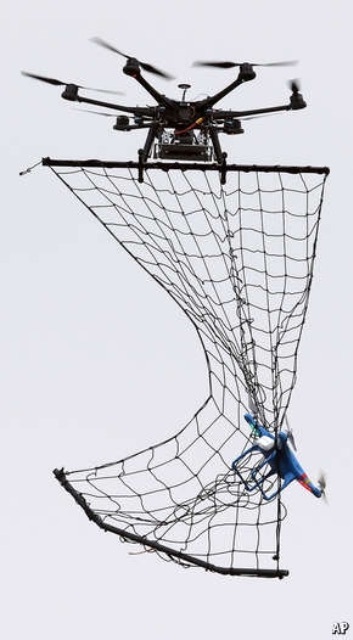 Malou’s hexacopter, the MP200, can be fitted with a dangling net that entangles its prey (see photograph) and brings it back for examination. Doing this requires a skilful ground controller, but Malou has set up a drone school to train people in the art. But the only other approach on offer at the moment is to create areas of restricted airspace around obvious targets and require manufacturers to incorporate them into the software of commercial drones as prohibited GPS locations.